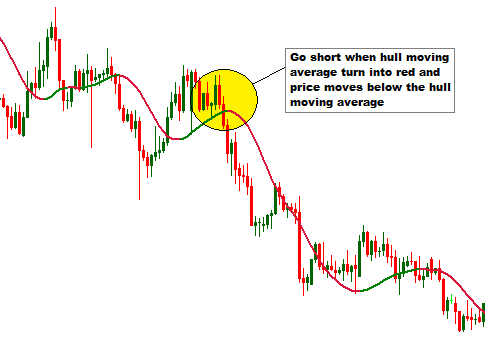 I have already written a post on "trading forex with traditional Moving Average", but this post is on "trading forex with Hull Moving Average". Hull Moving Average technical indicator is little different than the traditional moving average. The specialty of this technical indicator is that it changes its color over time to indicate entry and exit signals. Hull Moving Average technical indicator is developed by Alan Hull. Let's see how the Hull Moving Average is applied in trading. 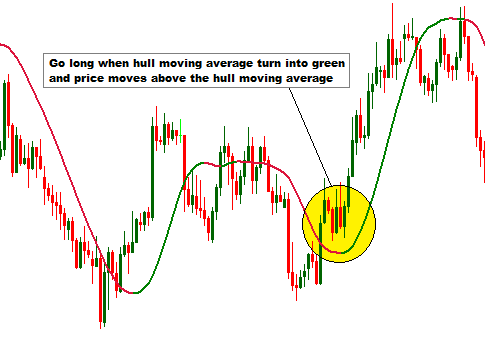 Hull Moving Average technical indicator can be applied on charts of any time frames. A 50 period Hull Moving Average can be very effective.We can trade the market with Hull Moving Average in different ways. Simply, a buy order can be placed when the Hull Moving Average turn into green, and a sell order can be placed when Hull Moving Average turn into red. 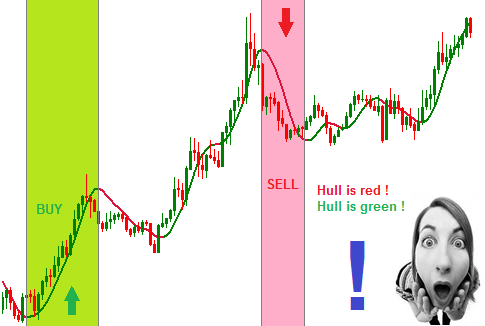 The colors of the Hull Moving Average can be changed as your choice. I generally use green and red colors for the Hull Moving Average on my trading platform. The color change technique of trading with hull moving average may not be accurate in all cases. To solve this problem a buy order can be placed when Hull Moving Average turn into green and price moves below the Hull Moving Average. The above illustration shows the technique. Similarly, a sell order can be placed when the Hull Moving Average turn into red and price moves below the Hull Moving Average. This technique is far better than the color change technique. Every experienced traders knows the fact that any single indicator cannot be sufficient to provide entry and exit signals. The effectiveness of any technical indicators depends on the trading system developed with it. Dear Traders, This is just the introductory post about Hull Moving Average technical indicator. I am always working to develop new trading systems with most effective technical indicators. If you have any question regarding this post, you can drop it into the comment section below. I generally response to your comments within 24 hours.